Cover for the new edition of Chucks! Here are some gift ideas from The ChucksConnection, especially for anyone who is an enthusiastic fan of chucks. Topping the list is the new edition of the book Chucks! The Phenomenon of Converse Chuck Taylor All Stars. This all color book is filled with hundreds of pictures of chucks, information about their history and lore, their presence in the media, and impact in the lives of their fans. Chucks! is available through this website and at bookstores everywhere. 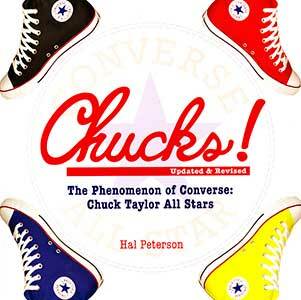 Order from The ChucksConnection and you will get a web exclusive — an autographed copy from author Hal Peterson. Get your copy now! This is a great gift for teenagers, young adults, or anyone who is a fan of Converse Chuck Taylor All Stars. Click on this link to order your copy. Do you want to encourage that teenager on your gift list to read? Check out our e-book mystery series, The Hunter and Holmes Mysteries. The series is about two teenaged boys living in the Silicon Valley who become amateur detectives to solve crimes and mysteries affecting themselves, their friends, and their community. This is a great gift for a teenager or young adult because they can read it on their smart phone, laptop, tablet, or reader. We also find that many adults enjoy these stories as well. Eight illustrated books in the series are now available, along with a new graphic novel called Senior Year. For more information on the series click here. Another good gift idea would be a ChucksConnection baseball cap or Converse tote bag. Click on the picture links at the bottom of this page to order. Looking for a smaller gift or a stocking stuffer? The ChucksConnection collection of shoelaces gives you an opportunity for a fun gift at a very small price. You can order pairs of classic laces in team colors, holiday colors, personal favorite colors, bright neon colors, or to match the canvas uppers of a pair of chucks. Like multiple colors? Our reversible laces are two color shoelaces in six color combinations. Rainbow and Red, White, and Blue weave shoelaces are another shoelace option that can add multiple colors to your chucks. New shoelaces are a great option for chucks-wearers of all ages. Or give a pair as a teaser for that big gift of a new pair of chucks! Looking for something that stands out? Our large supply of retro, fat, and extra fat shoelaces will give any pair of sneakers modern urban styling. Print laces are another style of fat laces that make a great gift. Your choices include checkered prints, a black, silver or red star prints, black and white skull prints, a white and black tribal band print, and a camouflage print. Express your patriotism with our wide red, white, and blue print flag pattern. There is nothing like a new pair of shoelaces to give your chucks a unique look. Click here to access our shoelace information and order pages. Another great small gift is a tube of Star Cleaner for Chucks, which is great for making pairs of chucks look new again. See our article about Star Cleaner for more information. What chucks wearer wouldn't like a new pair of chucks for a present? Not sure what to buy in style, model, or size? As far as model and color goes, why not choose something similar to what he or she is now wearing, but perhaps in a different color or pattern. Or cleverly bring the subject up in a conversation. People who like chucks will be more than happy to tell you what kinds of chucks they like or would like to have. Even if you totally strike out on model selection, brand new chucks are easily exchanged. Click on any of the shoe links below to get started. 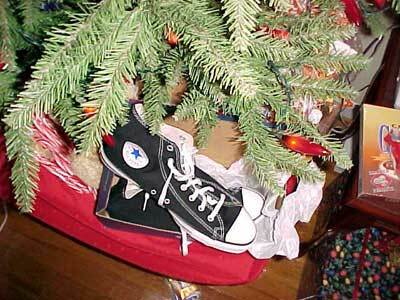 What could be better than a pair of high top chucks under the tree?